Are you looking for new ways to communicate important local events and announcements to residents and businesses in your area? In this case study, we share how the Orlando Downtown Development Board expanded the number of residents receiving their news and updates by 4,000 using OptinMonster. 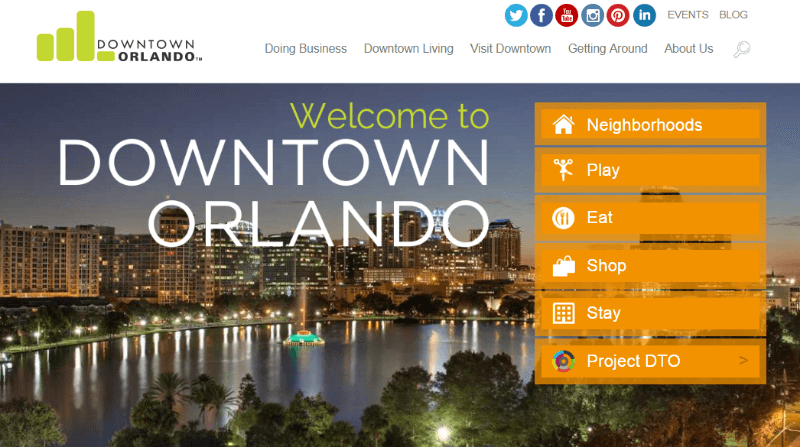 DowntownOrlando.com is the website of the Orlando Downtown Development Board (DDB). Their mission is to strengthen the role of Downtown Orlando as the economic, governmental and cultural center of Central Florida. The DDB is responsible for the planning, implementation and administration of the City’s core area redevelopment and development program. Prior to using OptinMonster, Downtown Orlando wasn’t using any lead generation software, so they weren’t quite sure what to expect. To start, they kept their goals simple. They wanted increase the size of two specific lists: events and business development. These two lists are some of their most effective tools for communicating new opportunities to both residents and businesses. Additionally, they needed a way to share time sensitive information like road closures or emergency communications, like a hurricane watch. They addressed the first two goals with lightbox optins, targeted to appear for visitors who had been on the site for at least five seconds. The events optin appears on nearly every page of the site, except on those pages where the business development optin appears. Our powerful page targeting rules allow you to exclude pages from where an optin can appear. This eliminates the annoying experience of multiple lightbox optins appearing at once. The events optin above converts 2.82% of visitors, adding 60-100 new subscribers every week. The business development optin converts 2.27% of visitors, adding dozens of targeted subscribers each month. 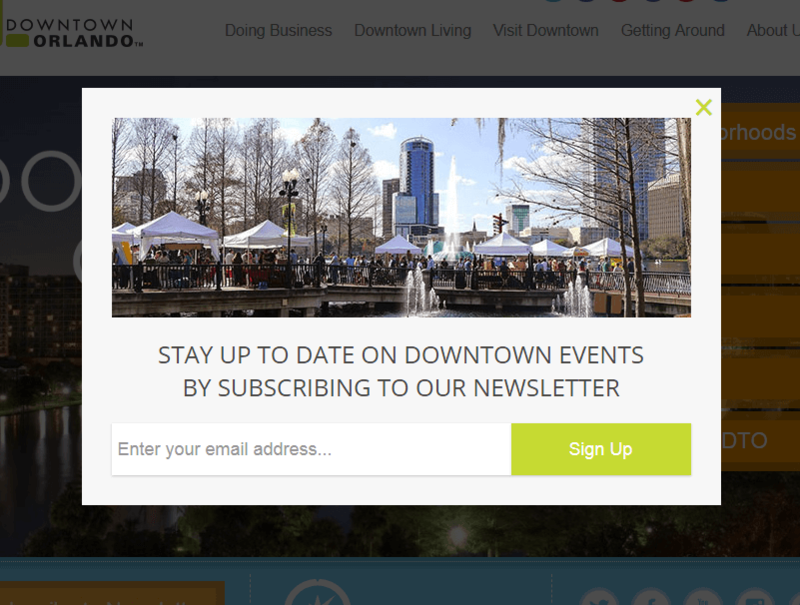 When emergencies arise, DowntownOrlando.com uses our floating bar optin to add a notice across the full width of the website, at the top of every page. The notice can include a button or text link directing visitors to a page on the site with more information if needed. Floating bar campaigns can also be used for lead generation and list building. For example, ActiveCampaign gains 800 new leads every month with a single floating bar campaign. DowntownOrlando.com uses OptinMonster to help residents and businesses discover the opportunities available in downtown Orlando. DowntownOrlando.com adds over 4000 targeted subscribers to its events list using a single optin. DowntownOrlando.com converts 2.82% of visitors with a lightbox optin. 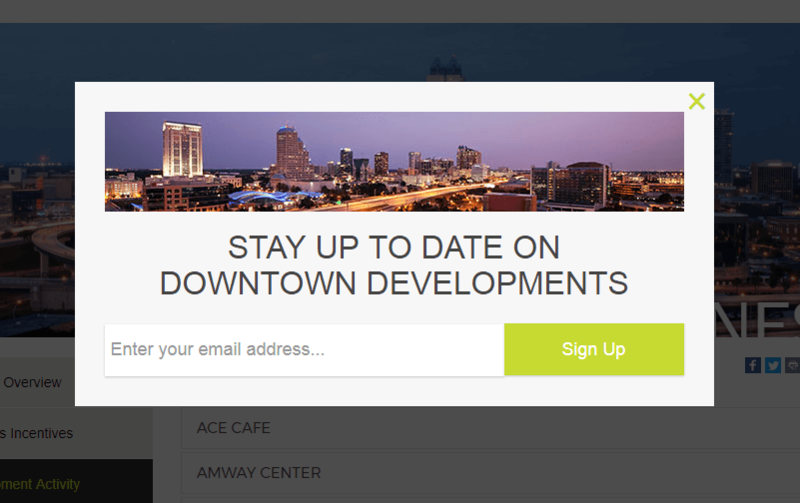 DowntownOrlando.com boosted their business development list 2.27% using a lightbox optin. Just because OptinMonster is simple to use doesn’t mean the results it produces are small. A single, well targeted lightbox optin can dramatically increase your list size.